I swim out Mummy’s tummy and wander about. I reach a place with many tall buildings, which excite me. Peering inside, I see offices with no one, as it is a Saturday. I visit the Nondon Museum, which tells me about Nondon in the past, which is nice, since I would have quite limited knowledge of Nondon before I was born today, though I think I would also enjoy exploring cities knowing next to nothing about them. With adjustable lenses within my eyes, I see a giant cucumber in a distance. This makes me excited again. I feel hungry. With desire rushing to the end of my earlobes, I swallow a few bagels (salmon and cream cheese) at Brick Lane. I see an exhibition by an artist called Sophie Calle. This is new to me. Her work is quite interesting. So this is what contemporary art is. I think I like art. I then put on earphones and walk a tour by Janet Cardiff. As someone new to Nondon, and on the Grand Tour of Life 3.0, I like the idea of being on an other tour while being on a couple of tours. Cardiff whispers into my ears. I hear sounds of footsteps. I am unsure if it comes from the earphones or the environment. I turn around anyway, and see a person behind me. She has a large pair of plastic wings on her shoulders, which she uses to wipe her mouth. ‘Come join me on my tour’, I say to her, and offer her one of the earphones. 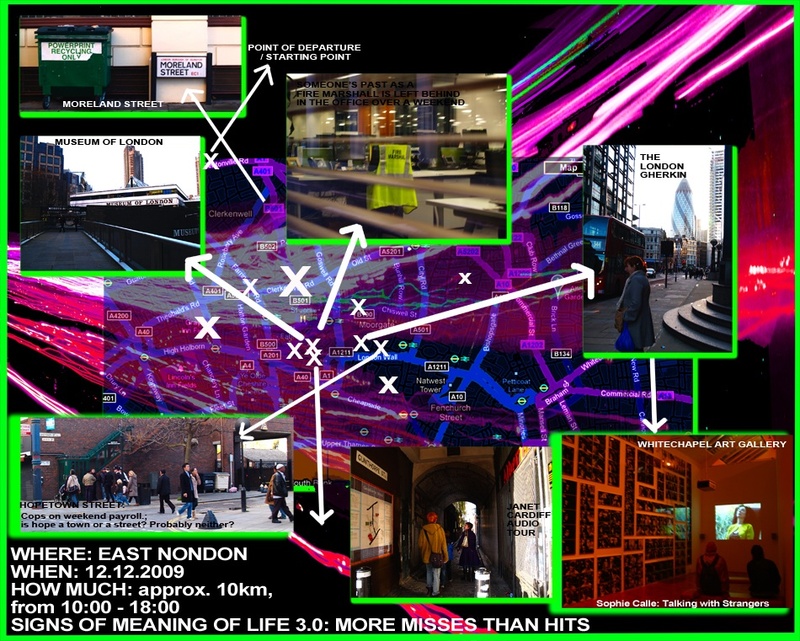 This entry was posted on Saturday, December 12th, 2009 at 07:05	and is filed under EARLY DAYS, NONDON A-Z and tagged with gallivanting, layers of lives, mapping, meaning, psychogeography, searching, subjectivity, travelling, walking. You can follow any responses to this entry through the RSS 2.0 feed. You can leave a response, or trackback from your own site.